All data is through October 2017 and is in thousand barrels per day. I have now included Equatorial Guinea although I only have data from January 2015 from OPEC’s secondary sources. The January 2015 E. Guinea data was extended back to January 2005. 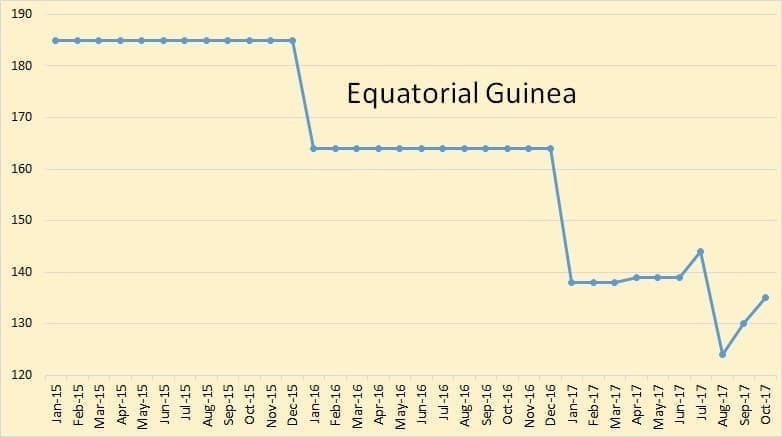 I know this is inaccurate but production from E. Guinea is so small it will make little difference. 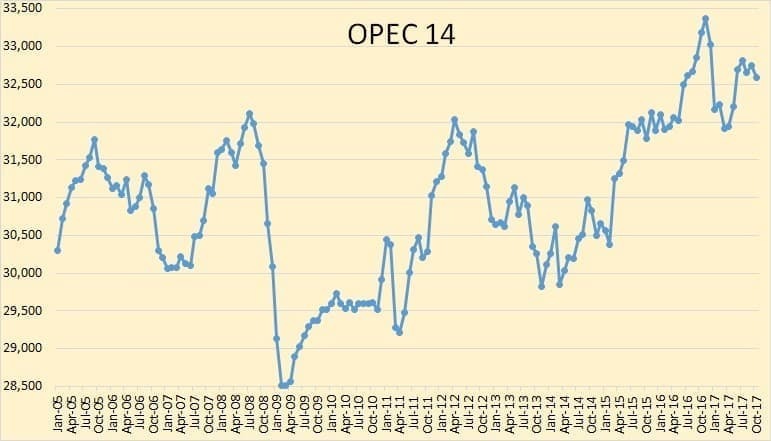 OPEC crude oil production dropped by 151,000 barrels per day in October. 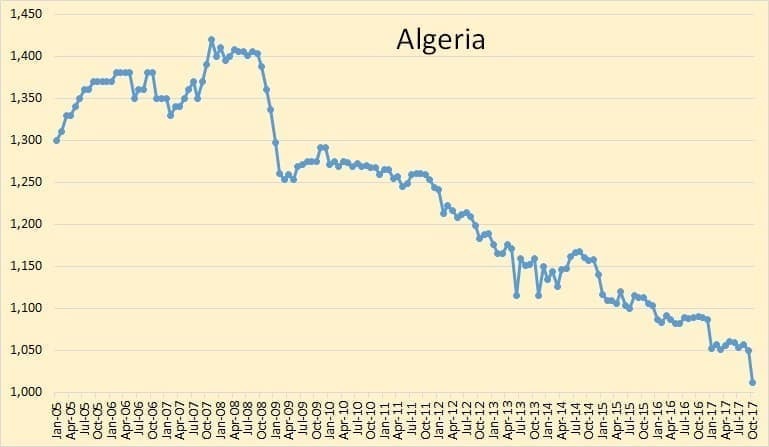 Algeria took a hit in October, down 38,400 bpd. 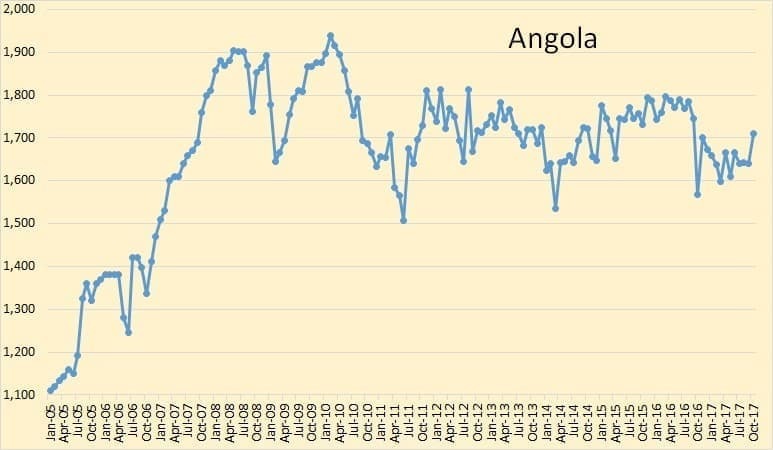 Angola was up almost 70,000 bpd in October. 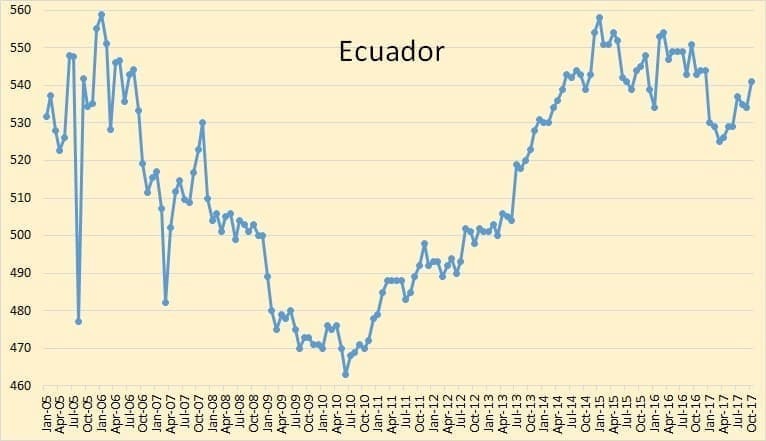 Not much is happening in Ecuador. They were up 7,100 bpd in October. I do not have historical data for Equatorial Guinea. 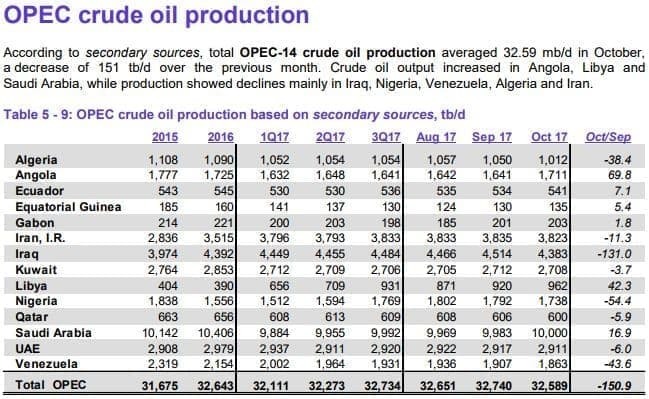 The OPEC MOMR gives average annual production data for 2015 and 2016 and quarterly data for the first two quarters of 2017. But now we will have monthly data from now on. 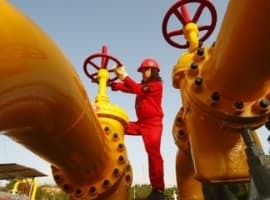 However, they produce the least of all OPEC countries and their production will make little difference. 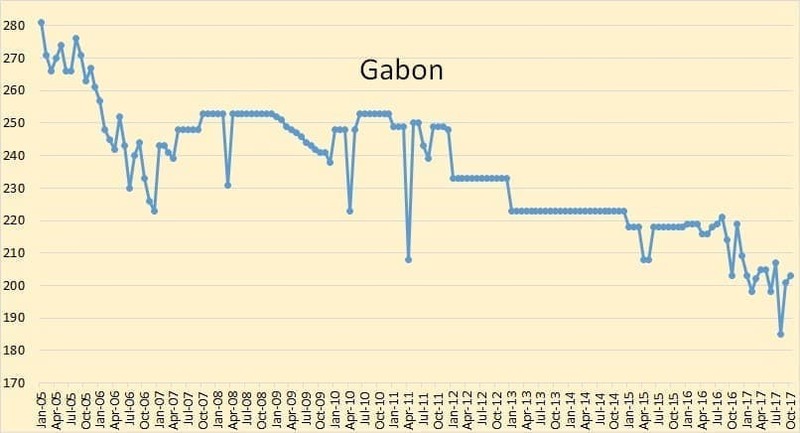 Gabon, another of the also-rans. Any change in their production will have only a small effect. 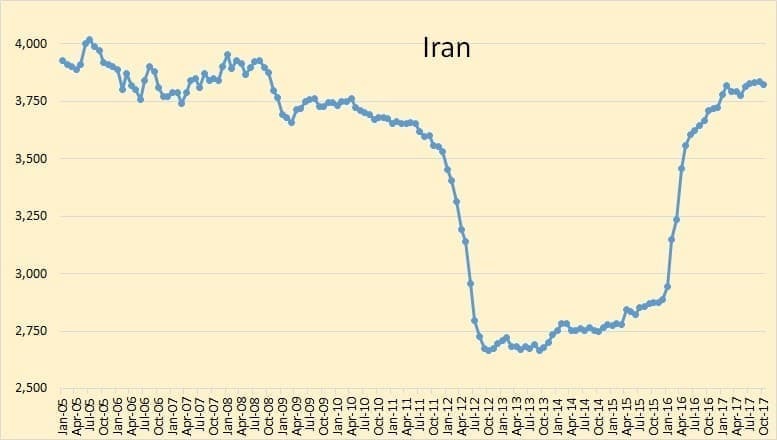 Iran has clearly reached a post-sanctions peak. 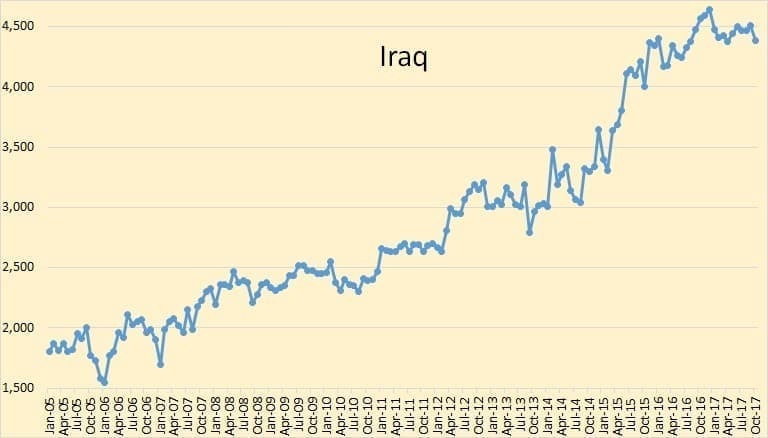 Iraq, OPEC’s second-largest producer, appears to have reached at least a temporary peak. 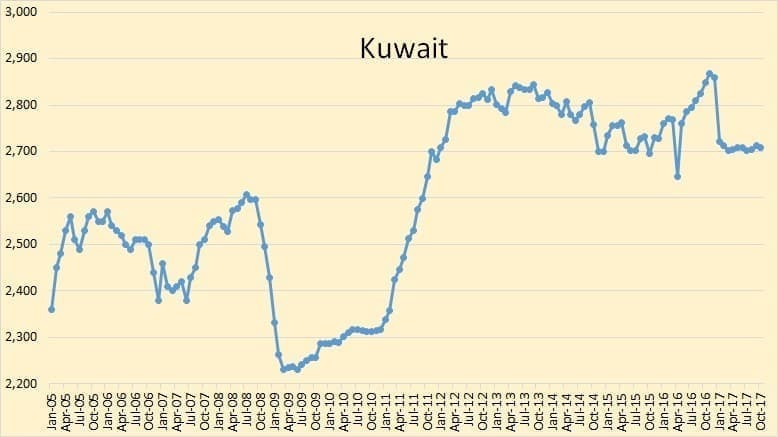 Kuwait’s crude oil production has been holding at just a tad over 2,700,000 bpd for all of 2017. 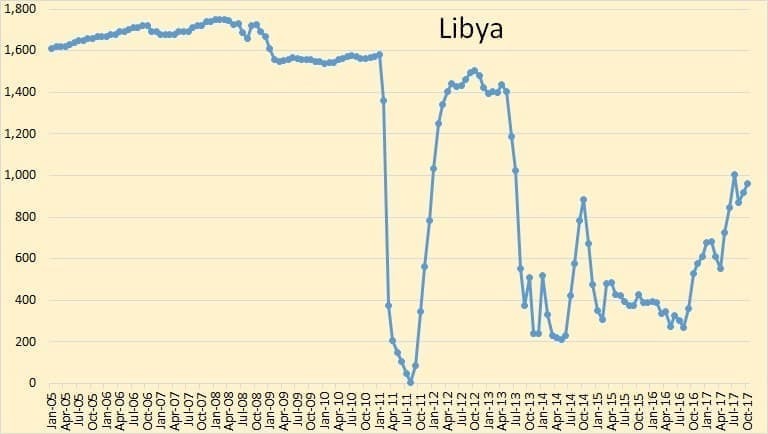 Libya has overcome most of their political problems. They should be producing a bit more than they are currently producing. Perhaps it will take them some time to repair their infrastructure. I believe Nigeria will always have serious political problems. They are dramatically overpopulated and will always have rebel factions. 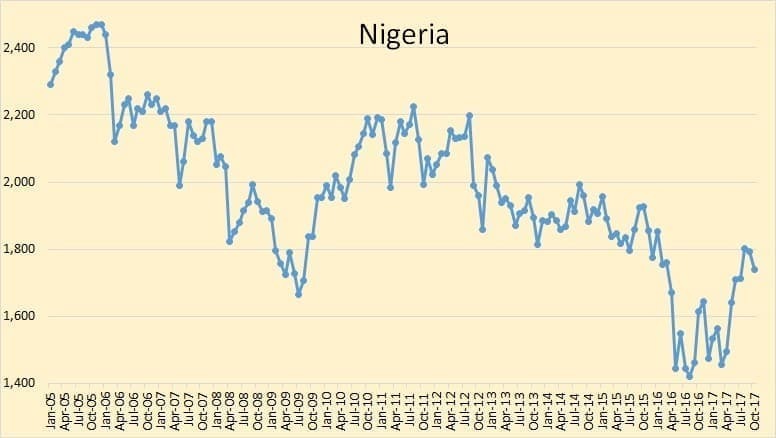 Don’t look for any dramatic increase in production from Nigeria. 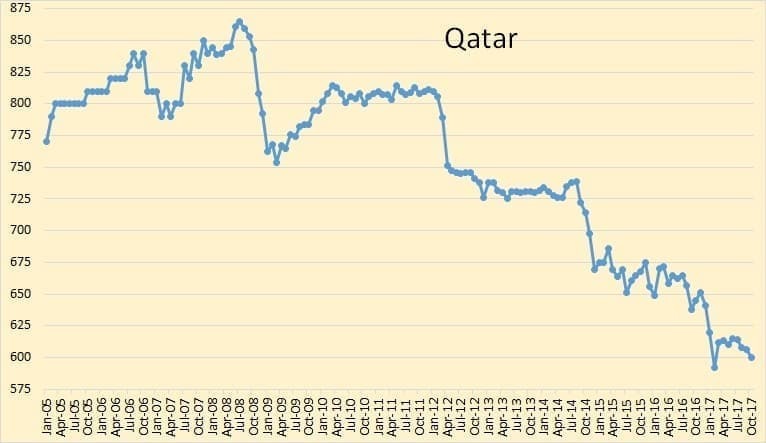 Qatar’s crude oil production peaked almost ten years ago. Their decline will continue. 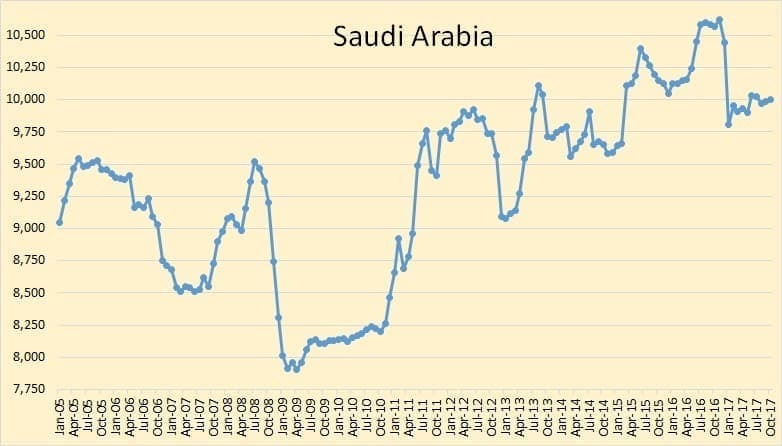 Saudi produced exactly 10,000,000 bpd in October. 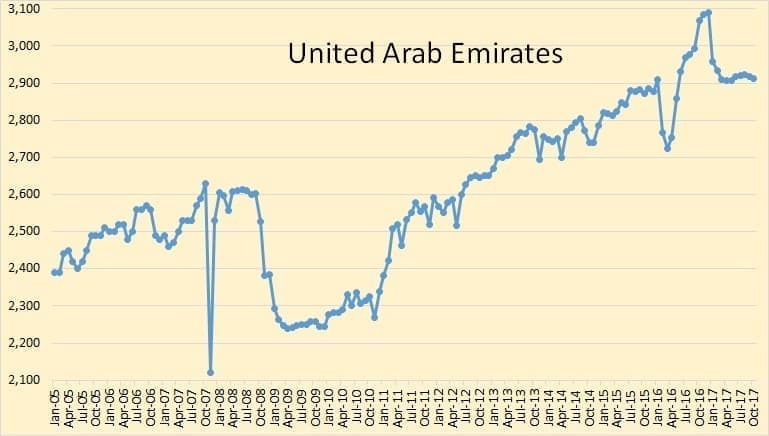 UAE’s crude oil production is holding steady at just over 2,900,000 bpd. 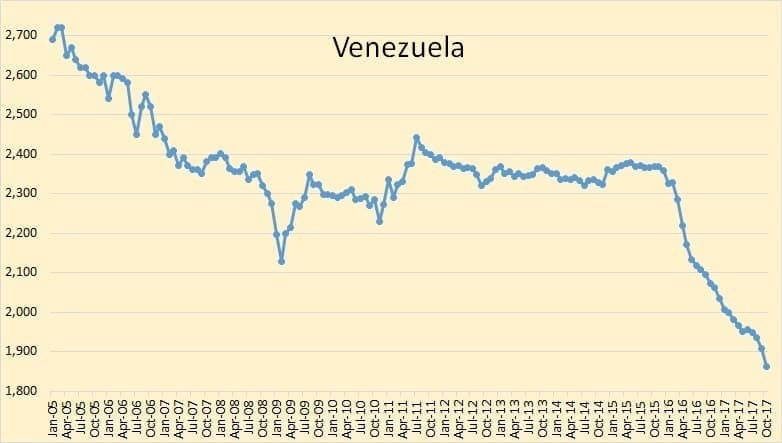 Venezuela’s crude oil production decline has accelerated in the last two months. Venezuela will very likely become a failed state in the next few years, or perhaps months. 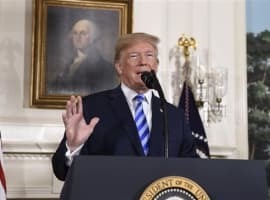 Their economy will totally collapse. 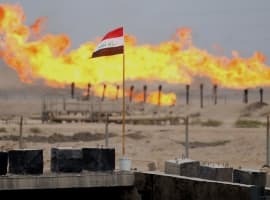 This will hit their oil production even harder. 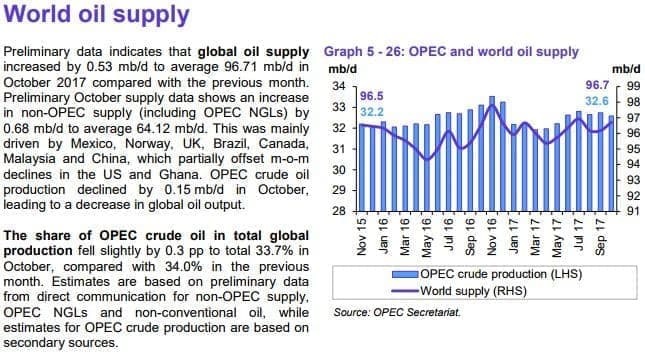 World oil supply has held steady for two years.